Our high temperature magnesia crucibles are formulated to offer maximum density in severe basic melting situations. Although the resistance to thermal shock is not a high as alumina, the magnesia crucible does offer a slightly higher temperature limit. Combining the basic characteristics of magnesia and minimizing the thermal cycling makes this crucible an excellent choice. Properly installed crucibles, with special attention given to ramming the bottoms and sidewalls, will help to ensure longer crucible life. Installation procedures should closely follow that of ram linings with proper venting and drying of the top cap. This will help to minimize top cap separation, keep the crucible in compression and minimize cracking. 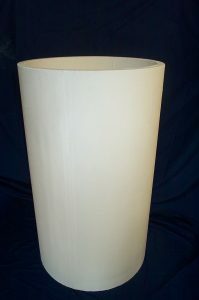 These magnesia crucibles are manufactured in standard sizes up to 1000 lbs. but can be tailored to your specific shape. Please call (203) 265-7112 or fill out the form to the right and someone will assist you with your order or questions.